The following remarks are excerpted from the 2018 Alternative Federal Budget press conference, featuring Gauri Sreenivasan, David Macdonald and Peter Bleyer (February 22, Parliament Hill). Today we are releasing the CCPA’s 23rd annual Alternative Federal Budget. Our Budget is a roadmap for policymakers; a set of realistic, fully costed proposals based on input from close to 100 economists and experts from across civil society. The Alternative Budget delivers a rigorous economic and fiscal framework grounded in a gender-based analysis. Politicians looking to deliver on gender equality would do well to examine our work. Halfway through its mandate, this government has taken some positive steps forward, but there is much more left to do to fulfill its promises: from justice for Indigenous peoples to closing the gender gap; from pharmacare to an inclusive economy; from tax fairness to action on catastrophic climate change. Canadians have set their sights on a better future. It will take courage and political determination, but it’s not that complicated. The Canadian economy has had a surprisingly good year. GDP is seeing normal levels of growth for the first time since 2012. The unemployment rate is hitting all time lows—and while the nature of that employment is precarious, the general trend is still positive. Strong wage growth, which hypothetically should come with a stronger labour market, has yet to emerge in earnest. At present, these good news data points are blips in the longer term dour projections for GDP and labour market growth. However, we need not simply accept that slow growth is our destiny. Instead, smart investments that build productivity are necessary to keep unemployment low and growth high and we need the federal government to play its role. That is why today we are releasing our 2018 Alternative Federal Budget: Getting There. Our budget puts forward bold progressive policy ideas rooted in a rigorous economic and fiscal framework. Our approach considers not just standard budget items but delivers a gender-based analysis, examines income distribution effects, and projects the impacts on poverty rates. In short, we show who benefits from our budget and how we can do better at lifting Canadians out of poverty. The 2018 Alternative Budget sees average transfers to the bottom 20% of families rise over $1,300 per family. The bottom 50% of Canadian families see higher after-tax incomes following our proposals. Figure from the macroeconomic chapter of this year’s Alternative Federal Budget. We also model the likely beneficiaries of new programs. We find that programs like pharmacare or zero tuition benefit families across the income spectrum. 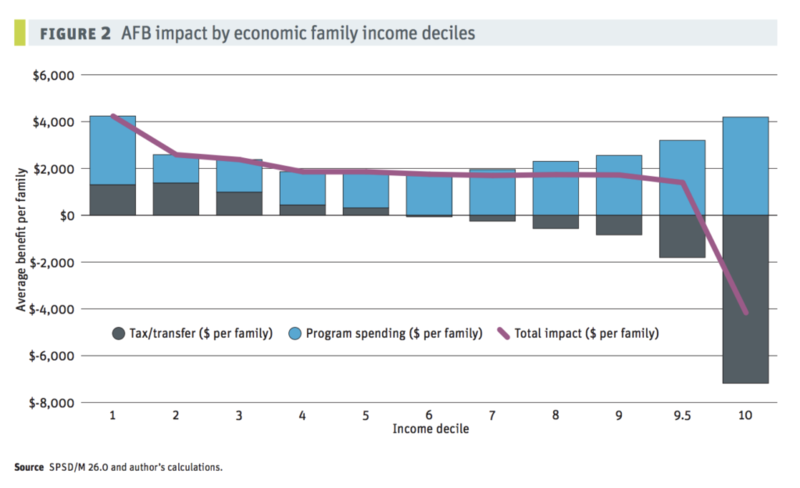 The average benefit from alternative budget programs is between $1000 and $3000 a family. 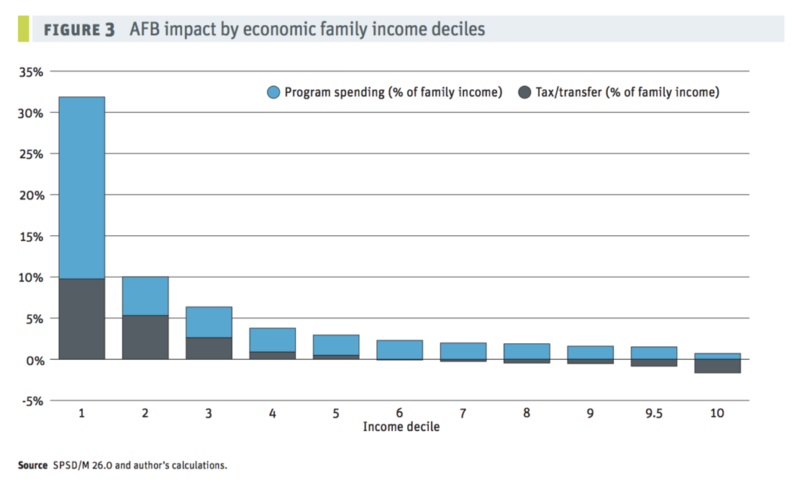 For the top half of families, they pay more in taxes but the improvement in programs more than makes up for it. The top 5% of families making over $250,000 do pay more in taxes and those taxes are not entirely offset by new programs. We think this is fair and we are transparent about it. This type of analysis is unique to the Alternative Budget, and something we’ve developed over several years. We encourage the government to incorporate it into their future budgets. On more traditional measures, we recognize that the federal government has a serious revenue problem. We rebuild its flagging revenue capacity by cancelling tax loopholes and closing tax havens. We do not accept that the wealthy should receive a big tax break leaving the middle class to make up the difference. We increase expenditures from what would have otherwise been historic lows, not seen since the Second World War. This results in a deficit that peaks at $53 billion or 2.3% of GDP. This first year deficit is particularly high as it immediately front-end loads major investments on First Nations reserves. The purposeful capping of on-reserve social program spending for the past 22 years has to end. We believe a one year jump in our deficit is worth it to rectify this historic wrong. After the first year, deficits decline by roughly $10 billion; and despite our deficit, the debt-to-GDP ratio remains in the low 30% range as our investments boost economic growth. Deficit spending also ramps up job creation, which peaks at over 600,000 jobs created or maintained in the second year. These additional jobs maintain Canada’s unemployment rate in the 5% range instead of watching the strong 2017 gains evaporate over the coming years. Our plan delivers an active federal government, building the programs that Canadians need while making the economy stronger and our tax system fairer. The Alternative Budget is guided by a compass that points consistently to this: invest in the diverse strengths of Canadians—they are the country’s most important assets. Let’s start with women, who make up 47% of the paid labour force. The Alternative Budget would create a fully-fledged national child care program that guarantees affordable and accessible spaces. It would also institute pay equity legislation immediately so that women’s labour is no longer discounted as a result of discrimination. First Nations, Inuit and Métis communities are rebuilding in the wake of colonialism, residential schools and the endemic underfunding of essential services. The Alternative Budget would invest $9 billion this year to make up for the loss in purchasing power created by decades of underfunding. For seniors, the Alternative Budget would expand the Canada Pension Plan Replacement Rate to 50% and increase the income exemption for the Guaranteed Income Supplement. 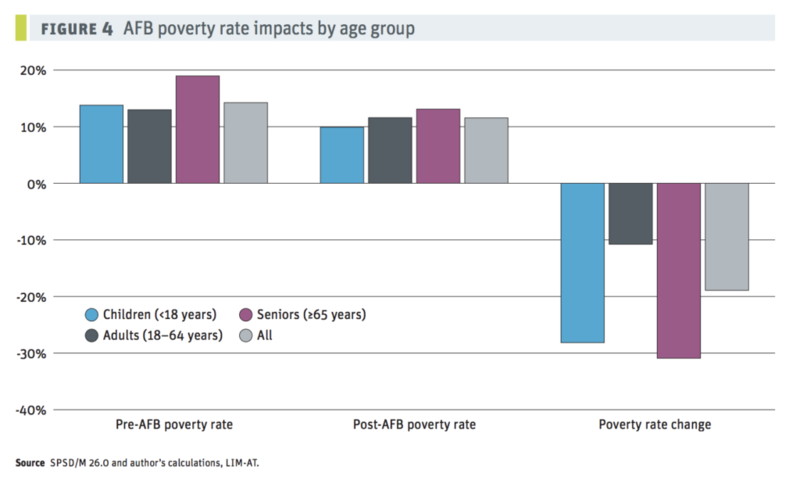 This will reduce poverty rates for seniors by 30%—the majority of whom are women. The Alternative Budget would support immigrants with greater access to training and accreditation, and ensure a path to citizenship for the most marginalized immigrant workers. Our Budget would also implement a comprehensive Action Plan Against Racism to redress the impact of racial discrimination. Shockingly, in 2015 1.2 million Canadian children lived in poverty. The Alternative Budget would increase direct transfers to low-income families, including a new GST top-up, reducing child poverty rates by roughly a third and lifting 600,000 children and adults out of poverty. For workers: our plan expands eligibility for Employment Insurance to better support workers in precarious employment, allowing them to choose better, more secure jobs rather than taking the first one available. In turn, this will mean a boost to wages, income and government revenues. For young workers and students, the Alternative Budget would eliminate tuition fees, which will lead to a better educated and more prepared workforce, and allow new workers to enter the economy without an unmanageable debt load. Our Budget increases funding to our public research institutions, providing opportunities for Canada’s brightest thinkers to pursue research unshackled by narrow restrictions. The Alternative Budget invests in public services, increasing health transfers to provinces, and implementing a pharmacare program—so that no family has to choose between medication and food. We know no family can be secure in the face of catastrophic climate change. Our plan will accelerate the increase in the national carbon price so that it reaches $50 per tonne two years ahead of schedule. It will moderate the impact on workers through rebates, while investing in training, apprenticeships and green infrastructure, including high-speed rail. More broadly, the Alternative Budget will invest in better public transit and more affordable housing. Our plan rebuilds our cities through public investment and public ownership, not through public-private partnerships, thus ensuring Canadians won’t pay a premium on infrastructure investments. In sum, the 2018 Alternative budget identifies clear choices a federal government could make if it wanted to show bold leadership in lowering poverty, reducing inequality, transitioning Canada to a low-carbon economy, and closing racial and gender divides. This is how you get there. We can afford to take the high road.